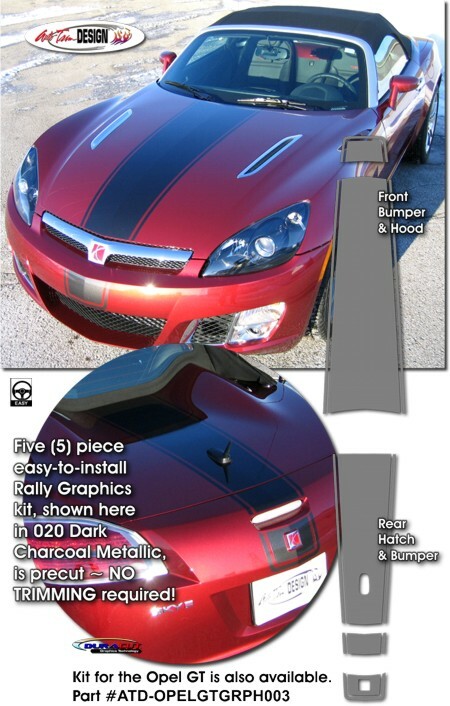 Make your '07-'09 Saturn SKY or Opel GT unique with this awesome Rally Stripe graphics kit. Easy-to-install kit is packaged as a set of five (5) pieces as shown. They're PRECUT and ready to install in a wide variety of colors - NO TRIMMING required! Stripe package is not just a set of straight strips in a box. Kit consists of pre-fit, tapered and contoured pieces that feature a 0.5625" (14.29mm) pinstripe at outside edges with 0.4375" (11.11mm) spacing as shown. This kit is specifically made for the '07-'09 Saturn SKY/Opel GT factory bumper, hood and rear hatch areas and will not fit any other vehicle. Optional Factory Spoiler Stripe kits available. Trimmable Spoiler Kit (ATD-SATSKYGRPH5) includes a piece 16" (40.64cm) in length that can be hand trimmed for custom spoiler applications.